In this month’s featured resource, Ichthus: Jesus Christ, God’s Son, the Saviour, insightful authors Sinclair Ferguson and Derek Thomas, explore nine defining moments in Jesus’ life and how these significant events led to widespread conversion in the early church. 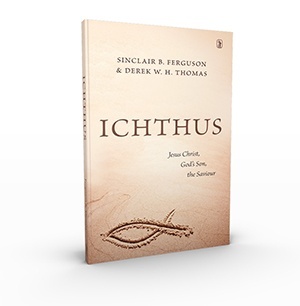 Clear and challenging, Ichthus will draw you into the world of early Christianity and reveal how first century believers became convinced that Jesus Christ is the Saviour. By delving deep into events such as the Incarnation, the Baptism, the Resurrection, and the Ascension, the authors give an intimate portrait of who Christ is and all that He has accomplished. Learn more about our Saviour this month in Ichthus or pass it on to a friend who may wonder about Jesus Christ . . . and why so many call Him Saviour and Lord. If you are a Truthpartner, call Customer Service at 1.888.588.7884 or email Truth For Life at truthpartners@truthforlife.org to request this monthly resource.